This is our primary tool for life-reorientation around prayer and the Word of God. It is a 85-page full-color guidebook that is used for personal study, small groups or seminars. Click on the heading or book cover to see more details. An easy to follow aid for experienced or novice small group leaders. Step-by-step instructions for leading meetings with scripted commentary and questions. This is a free downloadable resource (PDF format) for group leaders. Click on the heading or cover to go to the download button. 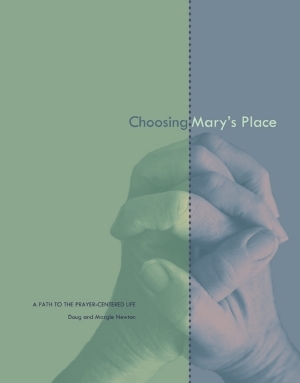 One secret to the effectiveness of Mary's Place is the way we approach reorientation through a four-fold method of increasing urgency, motivation, competence and commitment. Just Ask: Volume One focuses on motivation and competence. It helps people increase their confidence and boldness in prayer. Click on the heading or book cover to see more details. In the second volume in the Just Ask series we explore the salvation paradigms that have to do with redemption. The series is proving helpful to many people as they discover how a broader view of salvation reveals the heart of God and results in greater confidence in prayer. In the third and final volume of the Just Ask series we explore the salvation paradigms that have to do with revelation. God's work of salvation in Jesus Christ not only involves what God needed to correct, but also new "never-before-possible" realities He was wanting to create. When we see what God has in store for our future, we can pray and cooperate in bringing that new reality about. Perhaps nothing keeps us from prayer and a life of enjoyment and intimacy with God than busyness. Maybe you've tried and tried to deal with this problem. You've tried to slow down, simplify and create margins, but nothing has worked. Maybe there's another way that involves inviting God into the process. Try this guide. Got somebody you're praying for that is very challenging? Someone you've been praying for for a long time? Here's a prayer guide you can print out front and back to make cards that will fit in your Bible.